I went into the city today thinking since its a bank holiday nothing will be open and I could easily take some photos as I tried on Saturday and people kept walking in front of me. It wasn't the case at all as we had a Sunday service instead but I still managed to get some photos even though at times it was a little difficult. Quite a few of the buildings in Bradford are really old and have the most amazing stone carvings on but those buildings are slowly becoming a thing of the past as the council slowly knock them down to make way for more modern buildings which aren't lasting as long. When I went on Saturday and took a photo I came home and looked at it and noticed the boars head, the photo wasn't all that great so when I went today I took a better photo... Firstly the street name fits in so well with the store don't you think? "Legend has it that there was a ferocious boar that lived in a wood on the outskirts of Bradford, and frequently drank from a well in the wood. The boar terrorized the populace and caused much damage to land and property; so much so that the Lord of the Manor offered a reward for anyone brave enough to slay the boar and bring its head to the Manor House. A hunter took up the Lord's offer, and lay in wait near the well, ready to catch his quarry and thereby claim his reward. The boar duly arrived, and was shot by the hunter, who cut out the boar's tongue as proof of his victory and set off for the Manor House. A little time later, another hunter who had heard of the Lord's offer, was passing through the woods and saw the slain boar lying near the well. Thinking of the reward, he cut off the boar's head and he too set off for the Manor House. Arriving there before the true victor, he claimed his reward for having disposed of the ferocious creature, but was unable to account for the boar's absent tongue. Soon afterwards, the first hunter arrived and explained how he had despatched the beast - showing the boar's tongue as evidence of his veracity - and received his rightful reward; a plot of land called Hunt Yard just outside the town." I haven't bought anything from here yet as I only wear really simple jewellery and some of these pieces have charms etc... As I mentioned once I hope it does well but it really needs more stock and I actually think they should keep some craft supplies too just so that it makes it worth it to be there. 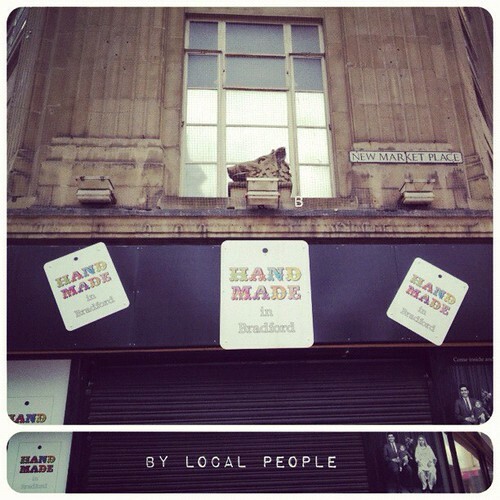 It still fits in with the shop name as people within Bradford will be making handmade things.